Rockstar Games wants to fatten up the wallets of GTA Online players by offering bonuses in remixes of Sumo and Running Back. GTA Online players can earn bonus GTA$ this holiday week, and just for logging in, players will be handed GTA$750K plus GTA$100K for each additional day through November 26. Play all seven days and you’ll earn GTA$1.35M which will deposited in your Maze Bank account by December 3. All week players will also earn double GTA$ & RP in Sumo Remix, all Biker Work & Challenges, Biker Sell Missions, and the vehicular collision sport Running Back Remix. Plus, all Bodyguards & Associates will earn twice the pay when taking part in Organization activities. Quite a few discounts are available this week covering sportscars, supercars, aircraft, properties, command units, and more. 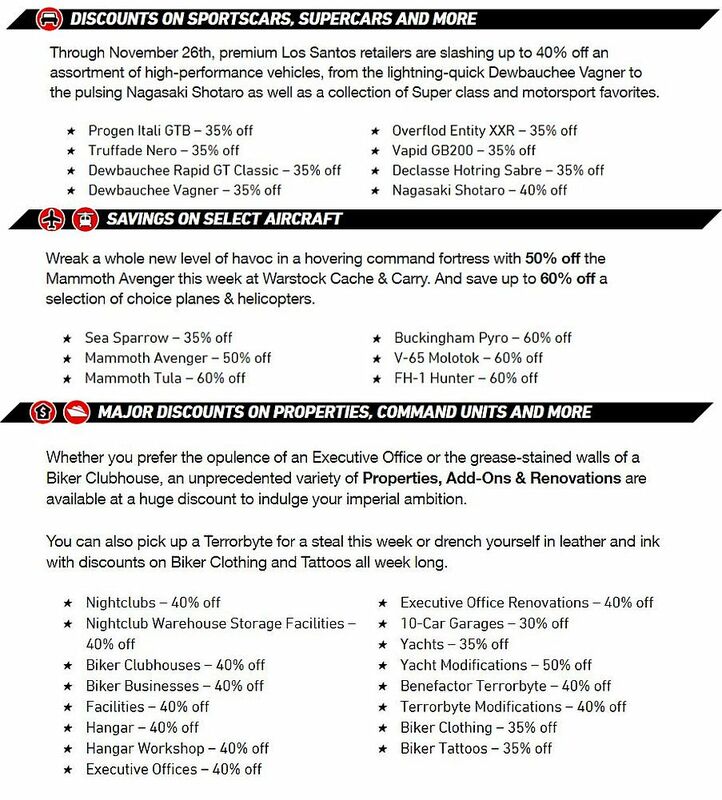 Discounts available through November 26 in GTA Online are shown below.